Since I acquired my new bike Carly from California, whom you can see in the foreground of this picture, I am thinking about fitting a dynamo to equip her with some fine electric lights. It seemed that in the 74mm fork domain, there's only the choice between the very expensive SON XS (200€) and the half-baked, still not cheap Dahon Joule, which for a price of 100€ only delivers power for a front light, not the rear. Although the difference is only 2.4W vs 3W in power, I think that having a rear light on the Joule will reduce the voltage which might yield bad results especially at lower speeds. Because I didn't like the price / performance ratio of either hub dynamo, I decided to go with a spoke dynamo as I have it on Knicki (the black thing you see on the right wheel on the second picture). But as I went to Berlin's recumbent geek meeting this week, I was told of a third manufacturer of small hub dynamos: the big Shimano itself! I don't know since when they're offering it, but as of now, the only official information I found about it was in Dutch language! If you switch the language to English on that page, the hub dynamo disappears! There seem to be several versions of that dynamo which is part of Shimano's Capreo series (the one that also has the famous 9 tooth sprocket). There are versions with 2.4W (boo!) and the real 3W. With 28 spoke-holes and with 24. 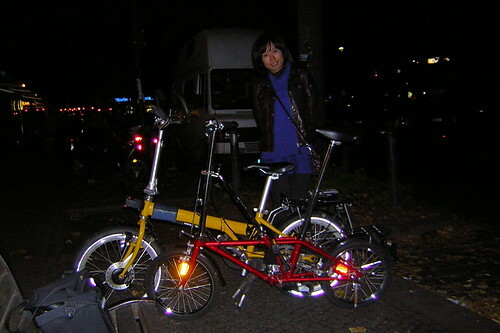 I just read on bromptonauten.de that there is a special Brompton version of that dynamo since 2009. This dynamo now is standard on the Brompton and finally replaces the old bottle dynamo, yay! It needs to be special because the Brompton has a narrower axle and very narrow nuts, no space for a quick release. 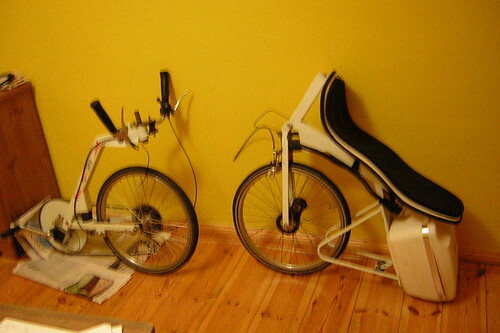 The Bromptonauts have two forum threads (in German) dedicated to the topic. Someone said that the original Capreo dynamo was made for Dahon, but since Dahon only uses their own Joule dynamo on their bikes, I suppose that Dahon Joule is actually made by Shimano and the 3W version is a spin off from that product. I still don't know how many versions of Capreo exist by now, but incidentally one of the few Google hits on the topic was a dealer in Berlin! So I will take little Carly for a ride to that shop and see if they have a model that fits. Maybe they even have a nice rim and spokes, so I can make a nice wheel.